Geez, I take one day off from commenting on the political doings in the sewer to bring class and sophistication to the proceedings here with a fart joke, and look what happens, we're wallowing in slime again. Wouldn't it be refreshing if the media could be discussing McCain's views on the Israel-Palestine situation, or an admission from him that while the surge in Iraq may result in fewer deaths, the political miasma there has worsened. But no. 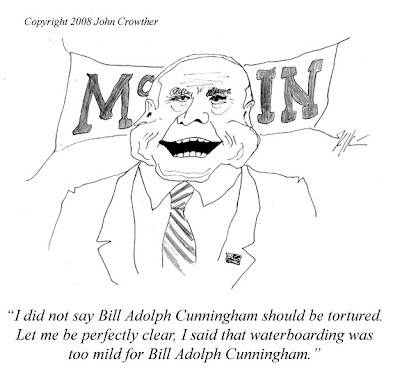 Notice that McCain didn't get on stage and immediately denounce his vile introduction by Bill Adolph Cunningham, the one in which Bill Adolph Cunningham trashed Sen. Obama. He waited until later, when he found out about the uproar Bill Adolph Cunningham had caused. McCain's reminding me more and more of what they once said about Spiro Agnew: "he's the kind of guy who'll bust you for pot and then smoke your stash." It should also be noted that Cincinnati radio talk show host Cunningham has now posted a video on his web-site in which he refers to Obama as a “hack Chicago politician from the Daley political machine” but in this instance he's avoided using Obama’s middle name. Cunningham says “I’m angry at McCain. Why would John McCain repudiate me? I’ve been able to unite McCain and Obama against me. I might become a supporter of Ralph Nader.” After that momentary threat, which may or may not have brought hope to the Naderites out there, Cunningham announced that he had decided to endorse Hillary instead. Too bad Ralphie! Better luck next time.